I finished this quilt top a few years ago. Almost 3 years ago to be exact (procrastination much?) I even had it spray basted for quilting via the push, pull and then pull out your hair method. I had a pretty good idea of what I want to quilt and thought I could achieve better results on the table than on the frame. At least I thought that 3 years ago. The machine I have on the frame doesn’t give me a whole lot of quilting space. I’m still dreaming of a “long arm” machine. I’m thinking 18” would be perfect for my short arms especially since I plan on doing all free motion work and have no desire for a computerized system. However I refuse to go into debt (even if it is a business purchase) for any item. Especially for one that I can’t drive to the store for groceries yet costs as much as nicer used car than the one I currently drive! I’m setting out to prove to myself that I can achieve those same results on this little machine. I already know I can do it with the machine on a table, I just don’t enjoy it as much. In the process I’ll be saving my pennies for a dreamy long arm. I haven’t decided which one I want. Each brand has it’s own set of bells and whistles and price point. I’m almost certain that I will go with a used machine as this will save several hundreds to thousands of dollars. I’ll be going to as many quilt shows as I can drag bribe my family into going to. I’ll share my insights on the different machines with you. I’ll also share with you tips and tricks I’ve learned along the way for using your short arm machine on a frame. 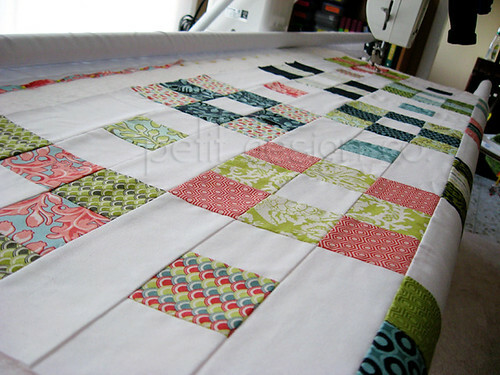 By the way, I hope you are still visiting the “Quilty Giveaways” page for fun quilt related giveaways. (There’s always a link at the top of the page.) There is a fantastic giveaway for an APQS Lenni long arm machine!! I don’t mind if you just skip it so my odds of winning are better!